Canada's Foreign Affairs Minister Chrystia Freeland: "We are definitely making progress." 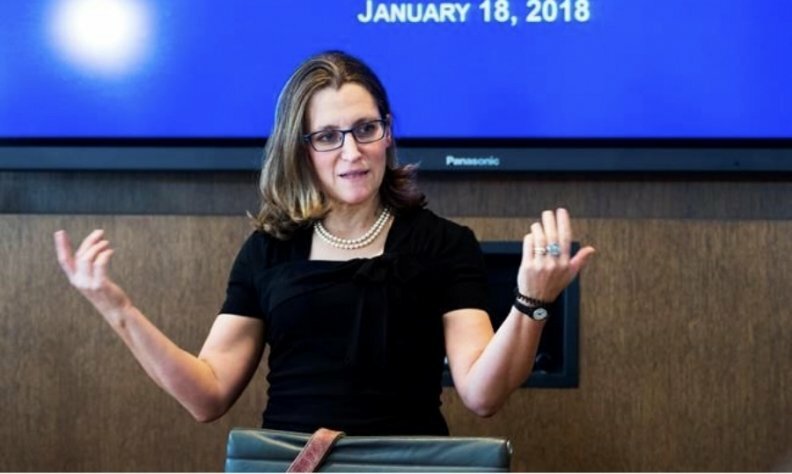 WASHINGTON — Talks with U.S. negotiators on revamping the North American Free Trade Agreement (NAFTA) were "constructive" on Tuesday with the focus on efforts to broker new rules for the automotive industry, Canadian Foreign Minister Chrystia Freeland said. Freeland, U.S. Trade Representative Robert Lighthizer and Mexican Economy Minister Ildefonso Guajardo are meeting in Washington this week in search of a breakthrough in a months-long drive to renegotiate NAFTA. Hopes for a deal hinge substantially on the three countries' ability to update rules for the automotive sector. After a brief meeting with Lighthizer, Freeland told reporters she had held "good, constructive" talks with the U.S. team and that discussions were focused on auto rules of origin. "We are definitely making progress. I am not going to predict the day, hour and minute that we will be finished. We are certainly very, very hard at work, negotiators from all three sides," she said. The meetings would continue, Freeland added. She, Guajardo and Lighthizer would be in touch by phone "and we'll get together today again as needed," Freeland said. President Donald Trump has led the push to retool the 1990s-era trade agreement, threatening to dump the accord if it cannot be reworked to his satisfaction. Trump blames NAFTA for causing U.S. manufacturing jobs to be moved to Mexico, and his administration wants changes that would bring more jobs and investment to the United States. Freeland has said that Canada was looking for a "good deal, not just any deal," on NAFTA and that her government would take the time required to reach that objective. Mexico's automotive industry has described the latest U.S. demands, which include raising North American auto content to 75 per cent from the current 62.5 per cent over a period of four years for light vehicles, as "not acceptable." The U.S. proposal would also require that 40 per cent of the value of light passenger vehicles and 45 percent for pickup trucks be built in areas with wages of $16 per hour or higher, which would create problems for lower-cost Mexico. Mexico's government has said it would put forward its own plan for the industry this week, and Jerry Dias, president of Canadian private sector union Unifor, told reporters he believed the discussions on the Mexican proposals had already begun.